I ussualy don't like to re-post stuff somebody has written/posted somewhere else; that is, a short summary of somebody else's blog, don't see the usefulness to that plus I try to keep this site with as much "original" content as possible. However here is a piece I can't pass as it touches my roots. Back in September 2006 Monica and I did an overnight bicycle tour to Point Reyes. 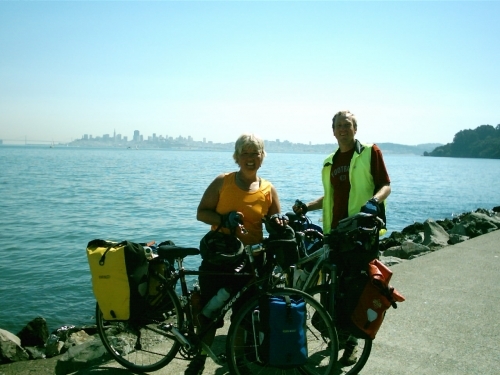 On the way back to San Francisco we meet Randy and Nancy, who were cycling from Alaska to Patagonia. Being Colombian I asked them if they were planing on riding through the country and they said said they had considered it but it seem it was to dangerous and probably would fly from Panama to Ecuador like most people do to avoid what in the US is known as "one of the most dangerous countries in the world". I told them there was to much misinformation about Colombia and that they probably would be safe. However like with any foreign land just use common sense. I know I would not like to be caught in some San Francisco (my adopted hometown that I love) neighborhoods at night, same principle different country. I remember receiving email from them early this year (2008) letting Monica and I know they had decided to ride in Colombia, I gave them the contact of a friend in Bogota but it seems they did not go to Bogota (IMO, a huge cosmopolitan metropolis in the true sense of the word.) Just today I came across one of their old emails and decided to visit their website and find out how the Colombia segment went. They have plenty to write about their experience in Colombia. For those whith short attention span here is Nancy's summary of their experience in Colombia. Their writings describe very close the country I know and how people behave. Believe me interesting writing not just of my home country but of all other places they've been. I read Nancy's summary -- that was a great read and nicely informative. Thanks for sharing!! !